Tulips are magic for so many reasons, their exotic majesty is a reflection of nature's miraculous beauty. These flowers have inspired poets and artists and bewitched nations with their allure. Legend has that tulips are the sleeping cradles of fairies. Umbria holds a yearly traditional Tulip Festival organised in the town of Castiglione del Lago. The colourful tapestry of tulips is a feast for your eyes in this scenic setting. More than one million of tulips are in display over the four days of the festival. Every day entertainment includes live music and a magnificent range of food. The Tulip Festival has been held in Castiglione del Lago since 1956, when Dutch families bought Umbrian farmhouses on the Lake Trasimeno and brought their country's tradition of celebrating the arrival of spring decorating windows, balconies and floats all with tulips. 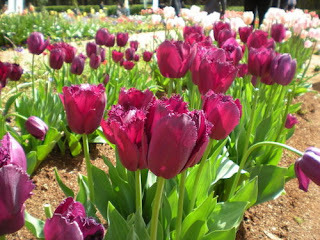 The Tulip Festival is held in April and attracts many people every year. The most important part of this event is the parade of floats decorated with banners of the four wards of the town (Castello, Prati, Molino and Fontivegge). The festival also offers the opening of the old traditional taverns serving typical Umbrian and Tuscan dishes, and tournaments between people dressed up in historical costumes. If food, music and books are my three favourite things in the world, interesting festivals sure come fourth. The Tulip Festival in Castiglione del Lago happens once a year in April, Castiglione del Lago is gorgeous in this time of year. Every house seems to be glowing with stacks of flowers. The last time I went to the Tulip Festival I guess it was a particularly packed weekend because weather-wise, it was probably the nicest day so far since the Tulip Festival had started. This is a not to miss display- the whole town is adorned by thousands and thousands of colourful tulips that frame balconies, windows, street corners, squares and shop windows. There is a real competition to set up the best floral arrangements and the scenery is spectacular- local families set up real works of art with the colourful flowers. The festival also includes a parade of floats, of course set up with tulips, the central piece of the event. Tulips are definitely the most important element of the event, but the festival is also based on a joust ‘Palio’ between the four town districts, opening of typical taverns, flag-wavings and parades in historical costumes. So would I recommend the Castiglione del Lago Tulip Festival? Well, only if you love nature, flowers, plants, the outdoors, beautiful landscapes, photography, picturesque settings... basically if you love anything that takes your breath away, you should definitely make it a point to check it out if you are here during the month of April.